Chocolate chip cookies and a large glass of milk go together. Everyone knows that – including Santa Claus. 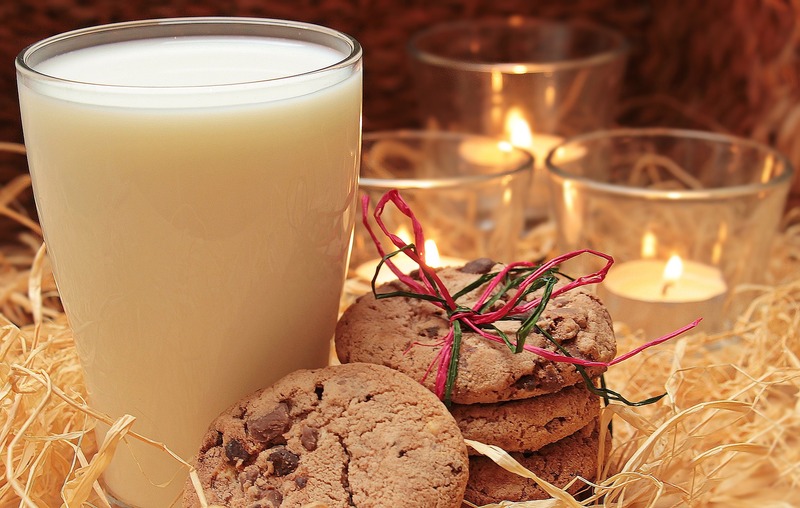 Leaving out a plate of cookies and milk on Christmas Eve is a time-honored tradition. Children may be concerned for Santa’s long night and want to make sure he has sustenance along the way. Or, more likely, if they think if there’s a margin of error on the naughty list, Santa is more kindly if there’s a plate of chocolate chip cookies waiting. Either way, Santa and Santa’s helpers have a long night ahead of them and a break for chocolate chip cookies and milk is just what’s needed. While you can have chocolate chips cookies anytime, it seems they become more special at the holidays. If you have been resisting them all year as part of a healthy lifestyle, the temptation may suddenly be too great to bear. Or, holiday stress and overwhelm warrant breaking the rules, just this once. More likely, the temptation for a chocolate chip cookie experience is embedded in your brain. Your brain remembers your first taste of a chocolate chip cookie, the aroma of freshly baked ones coming from the over, and the memory of being able to bake your first batch by yourself, even if it came from freezer dough. Every bite calls forth these sensations from your memory file of chocolate chip cookies. But, there’s something else that makes for these memories. Chemistry professor, Matthew Hartings, of American University explains why the chocolate chip cookie experience is so powerful. First, both chocolate and milk contain fat and emulsifiers. Chocolate has phospholipids which allow fat to mix (emulsify) with non-fats. This is why it has such a smooth consistency when cocoa butter and cocoa powder are mixed. Milk also has its own emulsifiers. They act to blend its fats into its rich creamy taste. When taken together, according to Hartings, it’s the milk that now emulsifies the chocolate chip cookie so that you get a richer and fuller cookie flavor. Second, there’s a memory of an “integrated sensory experience” which is a merger of flavor and aroma. Your brain receptors pick up the different molecules being released from the taste buds and saliva, as well as, the aromatic molecules. Together they mingle and merge to create a new sensation. Each new milk and chocolate chip cookie experience goes into the memory file and is compared to previous memories. That’s why a homemade chocolate chip cookie with whole milk may elicit a warmer and tastier feeling than store-bought chocolate chip cookies with skim milk. But, wait you say, you’re favorite chocolate chip cookie is a store-bought brand! Dr. David Kessler, former head of the Food and Drug Administration, points to the food industry tapping into your bliss point where its brain circuitry sensation is tied to a desire for more. If you’re Santa or one of Santa’s helpers, it’s understandable why a plate of chocolate chip cookies and a glass of milk is tempting. What do you think? Is it time for a little bliss? Lights up all the pleasure centers of the brain! Merry Christmas! It’s all about the enjoyment! I can’t make this up…I’m catching up on my blog reading with a twist on this treat. I’m not a fan of straight milk, but the bliss of chocolate chip cookies dipped in a bowl of melting ice cream? Unbeatable! Oh boy! You just blew my plans to have an hourglass figure for 2018! I am amazed at how the brain reacts to chocolate and mill. I didn’t grow up eating that on a regular basis but my daughter loves it. It’s her staple during the holidays and even on weekends. I’m sure she will grow up with fond memories of you and her chocolate chip cookies. I am not really a fan of cookies; however, I can be tempted with chocolate chips cookies. And I must have milk or ice cream with them. And, while I prefer home baked, there are several store brands that I can pig out on too. Bliss indeed and now I know the chemical reason for that. Thanks Joyce. The funny thing is that we can know the science behind something, but we forget it all on the first bite. Enjoy! It’s interesting to learn about how the brain reacts with chocolate. Yes… it IS time for more bliss. I’m always down for a good, chewy/soft chocolate chip cookie. It’s marvelous that something so small could be so blissful. The only problem is that you’re tempted to eat more than one. This was fascinating! Thanks for sharing the science behind the why. My hubbie makes the best chocolate chip cookies so I guess having a little love mixed in also helps. You’re so lucky April to have love infused chocolate chip cookies! I hope you enjoy the holiday treat; it’s a heavenly combination, and now we know why! I wish chocolate chip cookies had remained a special treat for the holidays. For me, there’s a saturation point. I’ll have to remember to wait until the holidays next year to indulge again. Looks like Santa gets to sample the best treats of everywhere he goes. Great, even a Carrot for the raindeer. Chocolate binds to your adenine receptors. Same as coffee. That is what my Hubster, the neuro-chemist, says. The milk part I hadn’t known before. Thanks! For us non-coffee drinks that’s why hot chocolate, chocolate milk, or in case of emergencies anything chocolate makes our brains function better. Chocolate chip cookie-milk combo isn’t part of the Indian tradition, Joyce, although both are enjoyed separately. I read your post with great interest because I remembered drinking 2 glasses of milk a day till the age pf 17 when my Mom used to flavor the glass of milk with Cadbury Chocolate Powder. I graduated to coffee flavored milk when I went to University but yes. my childhood memories are tied to chocolate, milk and my beloved Cadbury! Our favorite childhood treats have lasting memories thanks to our brains. I think it is one reason why certain foods or beverages calm us down and make us feel good because they elicit good memories. Cadbury obviously brings back fond memories. Chocolate is a rich, healthy brain food, especially if it’s organic. So, no problem there. Enjoy! It’s so interesting to read about how the brain reacts to milk and chocolate chip cookies. It’s no surprise food companies have worked this out and use their knowledge to entice us to indulge even more. Regardless, yes, it’s definitely time for a little bliss. So long as we keep it as a little bliss we’re good.